The ESCOLA Course Curricula and Content is a set of Open Educational Resources which are designed to be delivered in a classroom to encourage and facilitate teaching staff who use engineering labs for their courses to better utilise the full range of teaching resources – including visual and interactive – to improve the quality of the learning experience for students. It was written by experts who are passionate about engineering and highly knowledgeable about digital pedagogy. The Course Curricula and Content are designed for various uses. The course can be delivered as a complete curriculum or parts of it might be integrated to supplement other courses. All materials are provided as open source and each section of this course offers a variety of additional online materials such as case studies and activities about the topic. As some learners might want to learn the content (or just parts of it) individually, all modules and additional learning resources are provided online. Trainers, Teachers and tutors can also use the course freely. The course can be used in a classroom environment as well as a self-contained distance learning course. 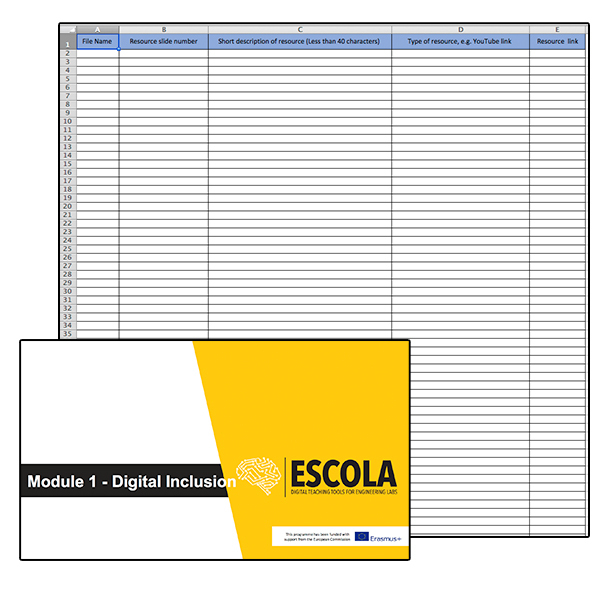 The syllabus of the ESCOLA course is divided into 6 different units called modules, each of them focusing on different aspects of immersive and interactive teaching approaches and digital teaching tools, how they can be applied and their benefits. A PowerPoint/PDF Presentation this is a suggested course and includes the materials and activities. If it is your first time delivering the course, this is a good starting point. Additional Resources- These will enhance the learning experience and provide extra reading for those wishing to expand on what they learn from each module. You can download the course (PowerPoints, Additional Resources etc.) as a zip file. You do not need to use the materials in any particular order. If you want to concentrate on a specific topic you can jump in at your point of interest – although using the whole course is suggested for optimal understanding. Please click the link below to download the Course. To access the file simply “Right Click” on the downloaded Zip file and choose “un-zip” or “uncompress” based on your Operating System. This will produce a folder on your computer with all of the necessary files.